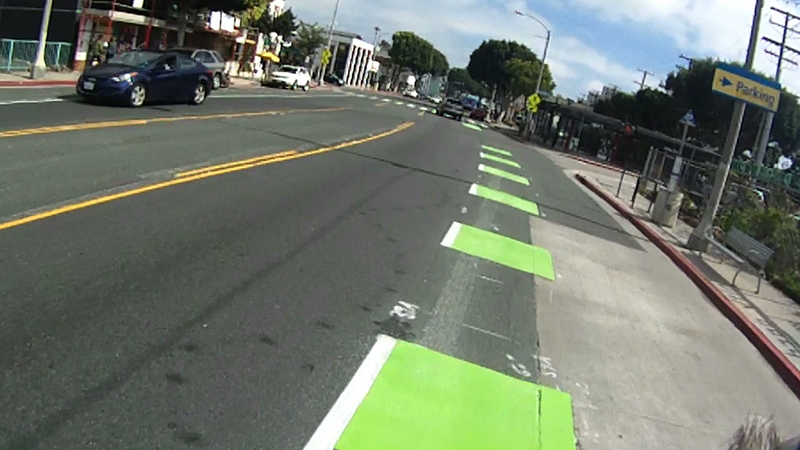 New green bike lanes below Pico in Santa Monica. When the revelers stumble out onto Main Street in Santa Monica tonight, they may think the street has been dressed just for those who pretend to be Irish by getting fighting drunk for a night. Even if the pavement matches the green beer they’ll soon be regurgitating onto it. Because actually, the street has been repainted for your benefit. And not just for one night. 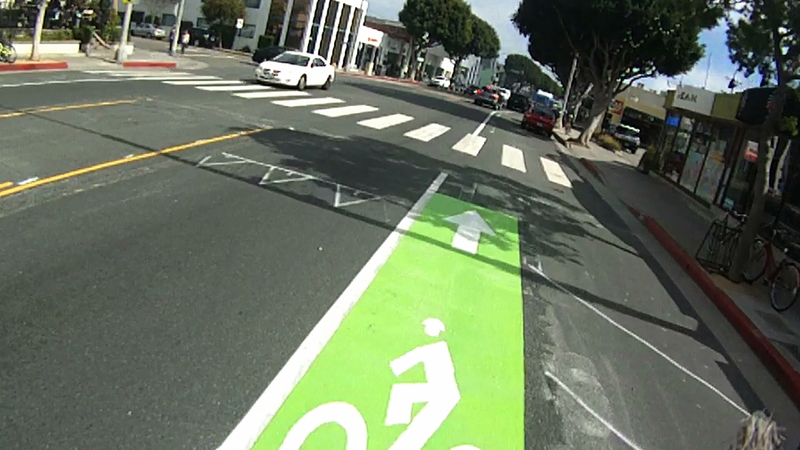 As of Friday, the much maligned door zone bike lane on the Santa Monica stretch of Main Street has been widened, and repainted in a vivid shade of green guaranteed to cause conniptions in a Hollywood location scout. Or at least, that’s the effect a similar shade had in Downtown LA. 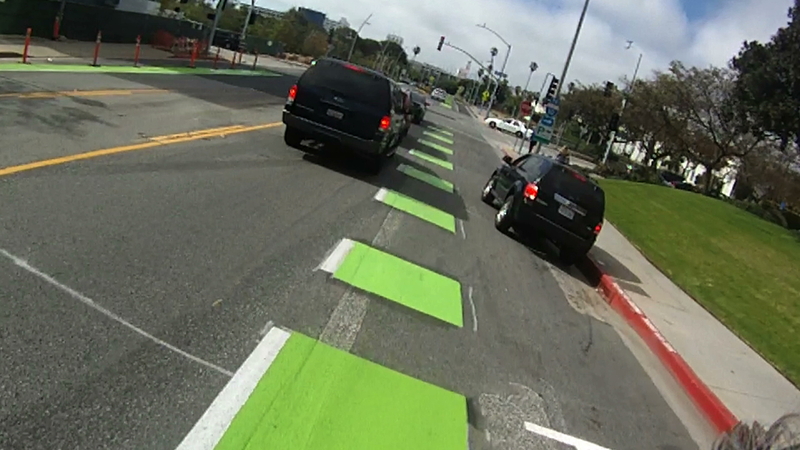 Intermittent patches of green lead up to intersections; you can see where the lane marker has been moved left. Maybe that’s why the lanes are only intermittent south of Pico, where they match up with LA’s normally hued lanes through Venice. And full green only north of Pico, where they pass through the city’s civic center, where presumably, fewer film permits are in demand. Or maybe Santa Monica just recognized the risk posed by all those drivers trying to access City Hall and the LA County Courthouse. In fact, that’s long been on of the mostly likely places to get right hooked among my usual riding routes, as confused drivers cut across the bike lane to access Civic Center parking. Broken lane leading to the entrance to City Hall/Courthouse parking lot. 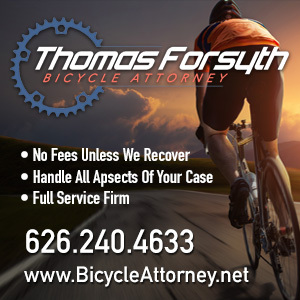 Whether a bright shade of green will help with that, or convince drivers they don’t belong there — despite the break in the paint — and make them more likely to turn across the lane rather than merge into it as the law and safety requires, remains to be determined. 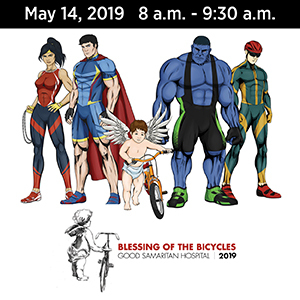 I’d rather see the full green on the south section as a vivid reminder to drivers to look for riders before opening their doors or turning across the lane. We’ll have to see if the city’s spot job will do the job. On the other hand, that extra foot of bike lane should make a huge difference by allowing cyclists to ride further outside the door zone without having to leave the bike lane. Here’s a fast-forward view of the civic center lanes on both sides between Pico and Santa Monica Place. Let’s just hope they hose them down in front of the bars Tuesday morning. 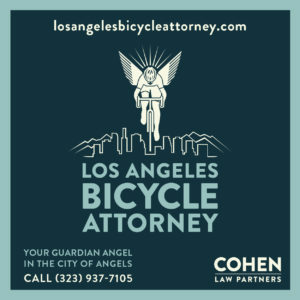 Just down the road and around the corner on Abbott Kinney, LADOT installed the City of Angels’ third and fourth bike corrals last week, on a street that has long suffered from a lack of adequate bike parking. When every other parking meter has a bike attached — which is technically illegal, though rarely enforced — it suggests an unmet demand, which the city has wisely heeded. Even if, on the day I checked it out, one had as many hipsters enjoying lunch in and on it as it did locked-up bikes. Just out of the frame, one more bike and two more guys sitting on the railing having lunch. A brand new bike corral, nearly full on a Friday afternoon. 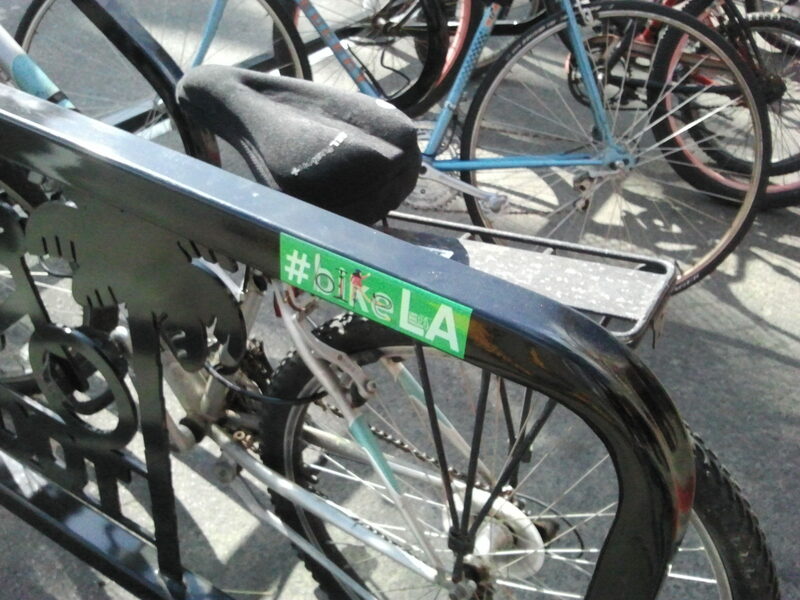 One of the new bike corrals adorned with the new LADOT #bikeLA sticker. 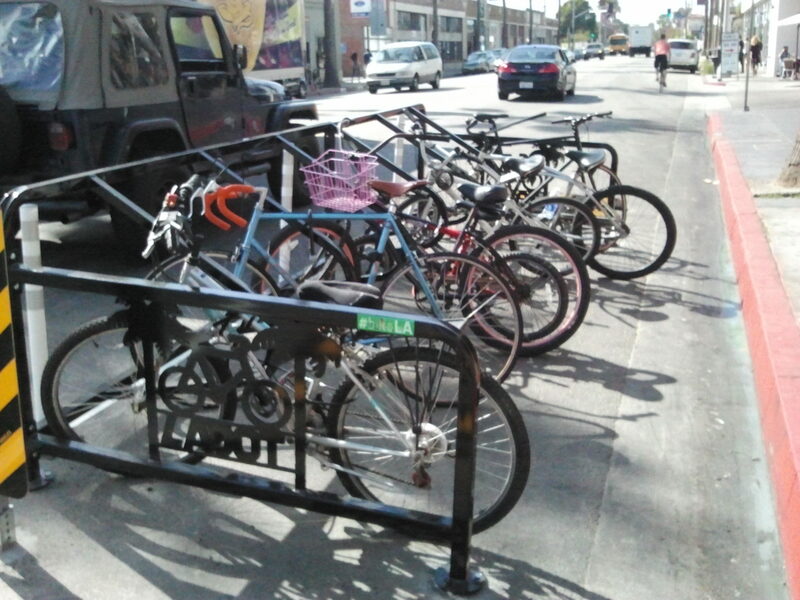 This corral looks very cool, but do you have any thoughts on this one-piece, multiple-bike style of rack as opposed to a number of standard inverted U-racks fastened to the pavement individually? My worry is that if part of the rack gets damaged the whole thing needs to be replaced, whereas replacing a single U-rack is much faster and cheaper. 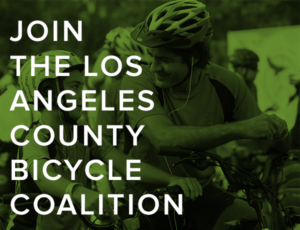 Once again, a neighboring city shows us in Beverly Hills how to plan for multimodal mobility. It’s getting to the point where we can’t hide the ineptitude and incompetence of our own city staff, or even cloak the cynicism of the majority of our City Council who continues to regard Beverly Hills as an island – and a suburban-minded island at that.